Ballet in a Boxing Ring? It was a knockout! 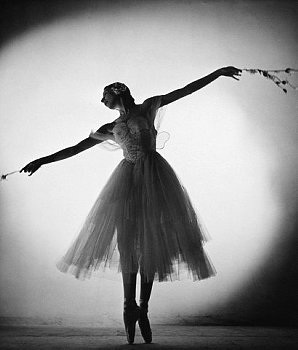 She may have been honored as only the third prima ballerina assoluta in history, but Alicia Markova was no elitist. While she often graced the stages of the grandest theaters and opera houses in the world, the down-to-earth dancer was just as happy pirouetting in an open field or baseball stadium (yes, baseball stadium!) if it meant bringing ballet to a new audience. At Jacob’s Pillow, Markova mesmerized audiences in a rustic outdoor amphitheater with the top ticket price a very affordable $1.50. In the Philippines, she performed in a barren outdoor cinema on a stage made of canvas-covered lemonade cases. (The scenic backdrop was a crazy quilt of old grain sacks, beautifully embellished with fragrant tuberose flowers.) And during World War II, she danced in a cavernous airport hangar near a San Diego military hospital. Her enthralled audience was composed entirely of injured soldiers laid out on white stretchers as far as the eye could see. But perhaps the strangest outdoor “stage” was during Markova’s visit to war-torn Manila, a city in ruins after the Japanese bombing and shelling raids during the Battle of Manila in 1945. 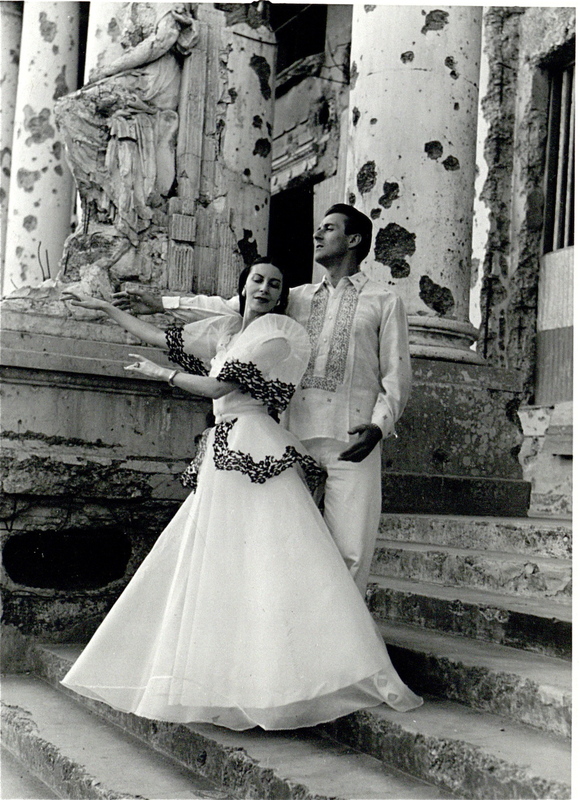 Evidence of that destruction can be seen in this photo of a decimated historic building where Markova and Anton Dolin posed in ceremonial dress presented to the pair by the grateful Filipinos. 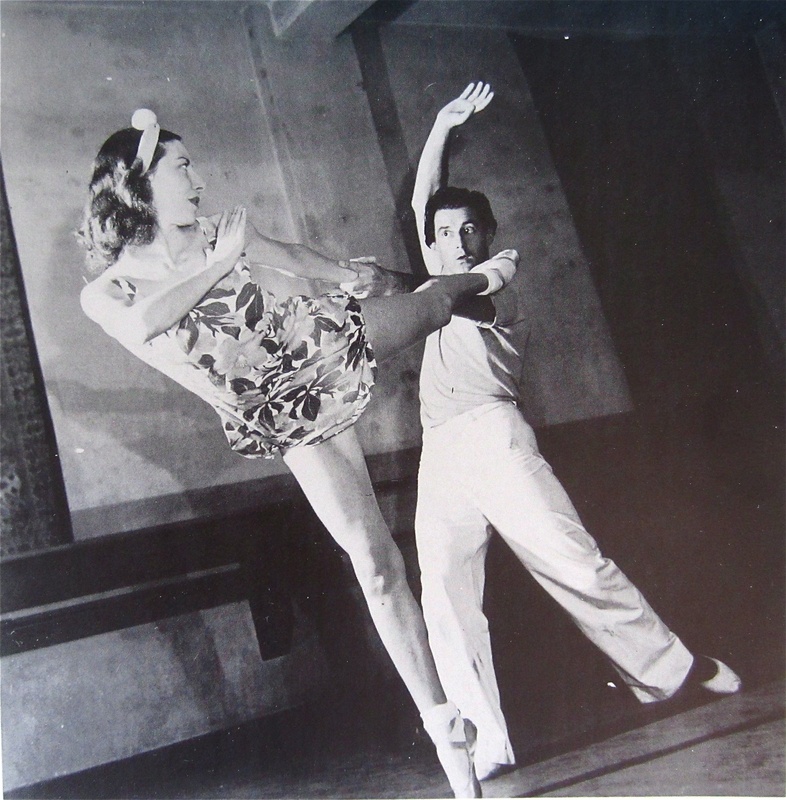 Markova jokingly referred to herself and Dolin as “pioneers of arena ballet.” Here shown rehearsing in 1945. Even indoors, Markova often danced in some rather unorthodox venues. She dazzled a sold-out stadium of 6000 at London’s Empress Hall at Earl’s Court, home to ice-dancing extravaganzas and ice-hockey matches. (She had to contend with a bitterly cold stage covering the ice!) She filled all 9000 seats nightly at North London’s Harringay Stadium, which more often played host to greyhound races and the circus. Markova laughingly recalled the smell of horses and elephants around every corner! 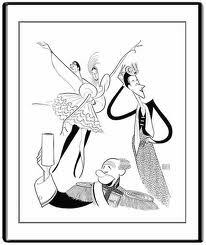 And she agreed to co-star in a Billy Rose Broadway spectacular called The Seven Lively Arts (caricatured at left by Al Hirschfeld), which also featured Benny Goodman, Beatrice Lillie and Bert Lahr (known best as the Cowardly Lion in the Wizard of Oz). Partnered with Dolin, Markova thought performing in a Variety Show on Broadway (1944-45) would bring in a whole new audience for ballet. As always, she was right. Recently, I had the pleasure of being interviewed by New York dancer Leah Gerstenlauer for Dance Informa magazine. When I asked Leah about her own career, I was fascinated by her association with Marilyn Klaus’s imaginative Ballets With a Twist. Last year the company got rave reviews for its enterprising marriage of unorthodox ballet venue – the buzzy Manhattan XL Nightclub/Cabaret/Lounge – with like-themed “intoxicating” choreography – Klaus’s Cocktail Hour. “Conceived and choreographed by critically acclaimed dance-maker Marilyn Klaus, each piece is inspired by a well known cocktail and brings one of the highest art forms to the masses in a fresh playful way,” commented Shelly Ng, for WPIX 11 TV. “Leah Gerstenlauer, [above right], was the latest specter flitting through the shadows of ‘Absinthe,’ a tribute to the green wormwood-flavored liquer associated with hallucination, addiction, and 19th century Paris,” wrote Stephanie Woodard for The Huffington Post. 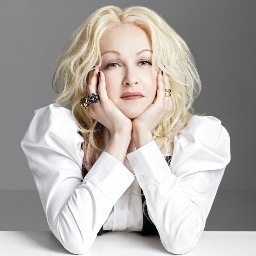 “Klaus blasts the boundaries between high art and entertainment. . . . We have seen the future of dance, and it is fun!” Cyndi Lauper, the “Girls Just Want to Have Fun” gal herself, joined Ballets With a Twist for a charity event at XL to benefit her True Colors Fund. 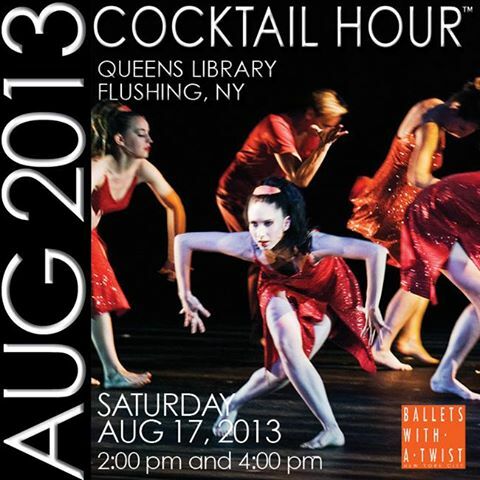 And a recent Ballets With a Twist performance at the Queens Public Library in Flushing was an equally engaging venue – one Markova would have undoubtedly delighted in. She would also have been wowed by the wonderfully creative production, melding ballet with mainstream wit and avant-garde Surrealism. 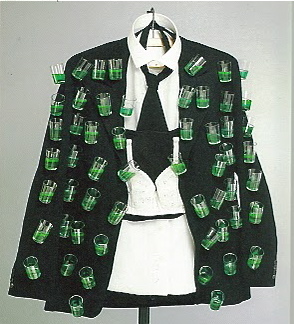 And speaking of Surrealism, the ingenious cocktail dance costumes by talented designer Catherine Zehr reminded me of another fanciful drink-themed outfit created by legnendary artist Salvador Dali, the subject of my last blogpost. 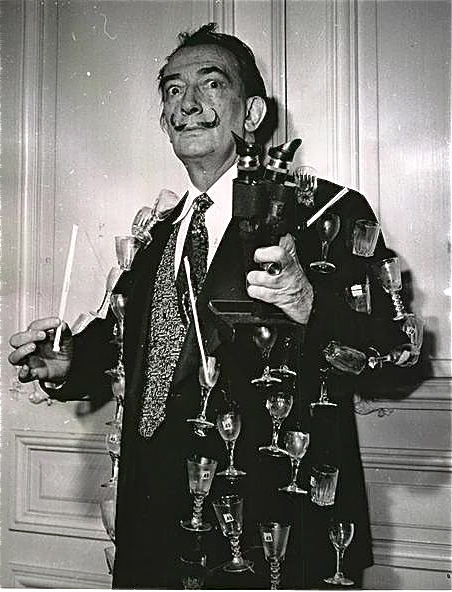 It was 1936 when Dali decided to embellish his formal dinner jacket with eighty-one glasses of creme de menthe, each containing a straw and dead fly. He dubbed it his “aphrodisiac jacket,” though the flies kind of kill the mood for me. 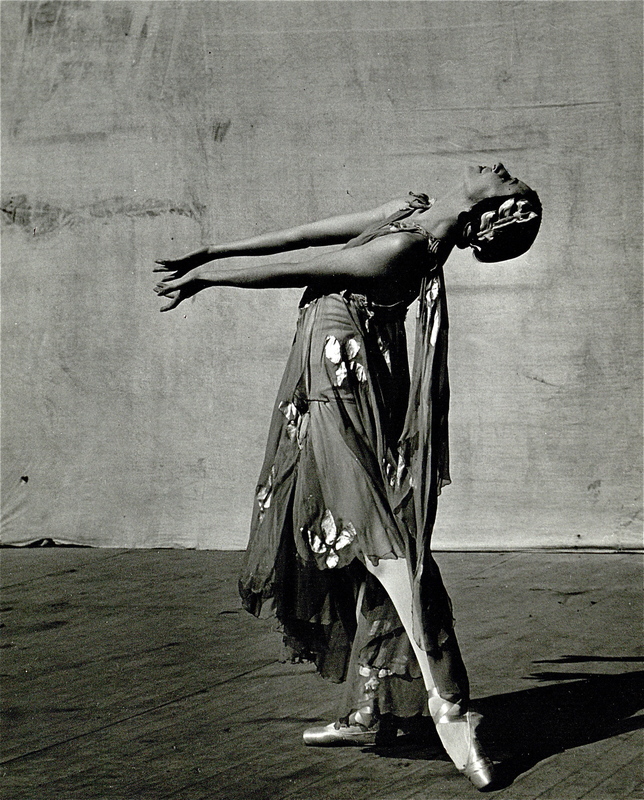 Markova had her own ballet cocktail experience when dancing in Johannesburg, South Africa in 1949. With ballet fever in full force, the local bar named a drink after her. A teetotaler, Markova never learned the chosen liqueur, but “crème de la crème” sounds about right. I discovered your book at the public library and am enjoying spending time with it. The story about Markova performing in a boxing ring in Liverpool caught my attention as one of my favorite boxers, 2012 Olympian Natasha Jonas, is from Liverpool.